The disturbance is centered near 16° N / 111° W or a little less than 500 miles south of Cabo San Lucas and a little less than 500 miles southwest of Manzanillo. A new tropical disturbance is about to reach tropical depression stage. The disturbance is showing increased banding and it appears that a closed low has just about formed. 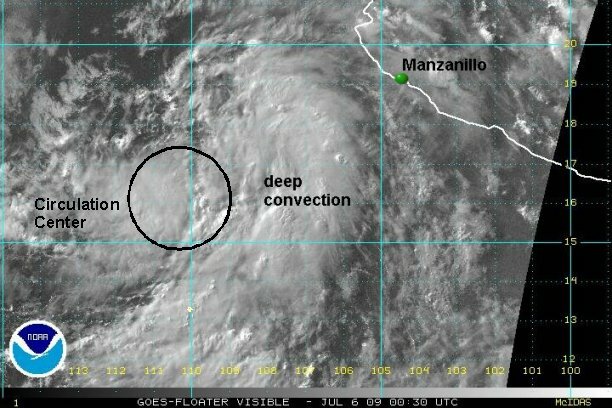 The convection around the center of circulation has also increased and we estimate that this will be a depression soon. The disturbance is moving west northwest away from Mexico and effects will be minimal. The tropical disturbance is centered about 450 miles south southwest of Cabo San Lucas and moving west northwest away from Mexico.....effects will be minimal. Advisories from NHC will likely be started at 8 am pdt. 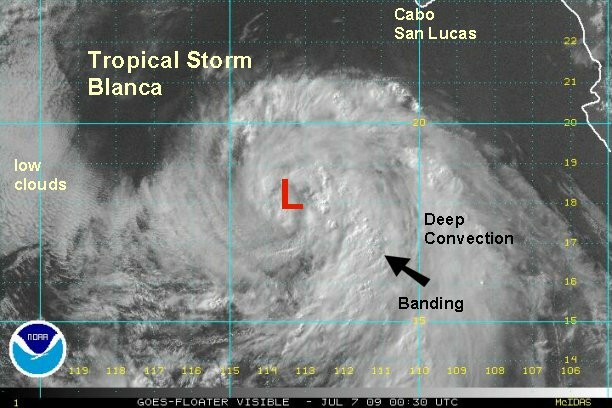 As of 3:45 pm edt (12:45 pm pdt ) Balanca is centered near 17.8 N / 112.8 W or about 390 miles south southwest of Cabo San Lucas. Movement was wnw at about 10 mph. NHC estimated top sustained winds of 45 mph on the earlier advisory. Even though the very deep convection burst over the center of circulation has waned, satellite imagery looks to support about 50 mph top sustained surface winds now. 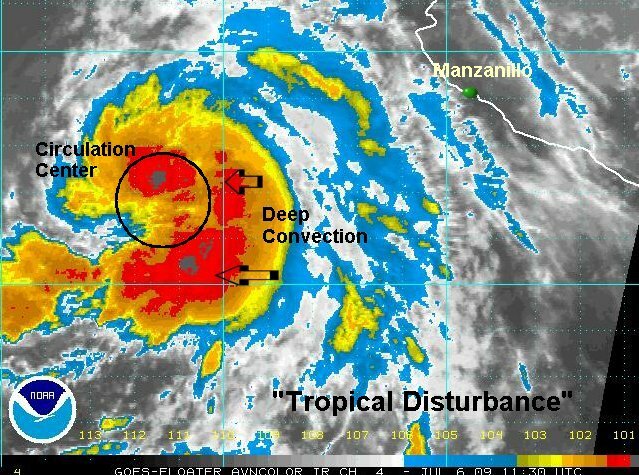 This tropical feature poses little threat to Mexico. Rain bands are offshore and movement is away from land. The only noticable effects will be higher than normal swell on the southern Baja and western Mexico. As of 9:30 pm edt ( 6:30 pm pdt ) tropical storm Blanca is centered near 18.0 N / 113.8 W or about 415 miles south southwest of Cabo San Lucas. Top sustained winds are estimated near 45 mph. I.R. satellite imagery shows cloud top warming near the center of circulation. Because of this we are lowering the winds to 45 mph from 50 mph. Outflow has improved aloft all sectors and is excellent on the eastern side of the storm. Blanca is moving just north of due west. This will move it over cooler water shortly which should inhibit much strengthening. 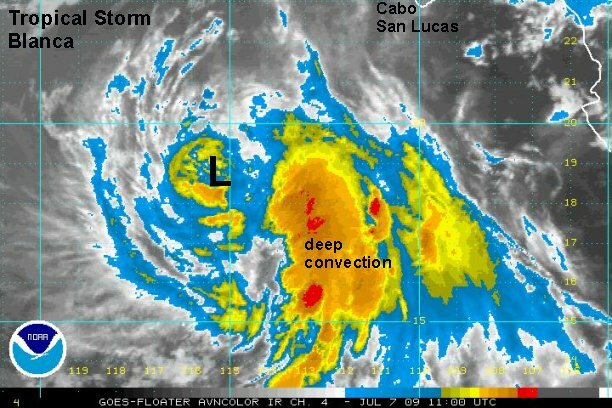 In fact look for weakening as it moves over the cooler water in 12-24 hours. Blanca is not a threat to Mexico. At 8 am edt ( 5 am pdt ) tropical storm Blanca is centered near 18.6 N / 115.3 W or about 440 miles southwest of Cabo San Lucas. It is moving west north west at about 12 mph. Top sustained winds are officially 50 mph. We will estimate 45 mph at this time with a deteriorating appearance around the circulation center. There is on solid band on the east side that may have some gusts to 50 mph. Unfortunately, no quickscat is available to help with the estimate. It is amazing how many times the satellite "misses" the zone on interest. Better luck next time. Blanca is heading toward cooler water and will start to weaken soon - in the next 12-24 hours. 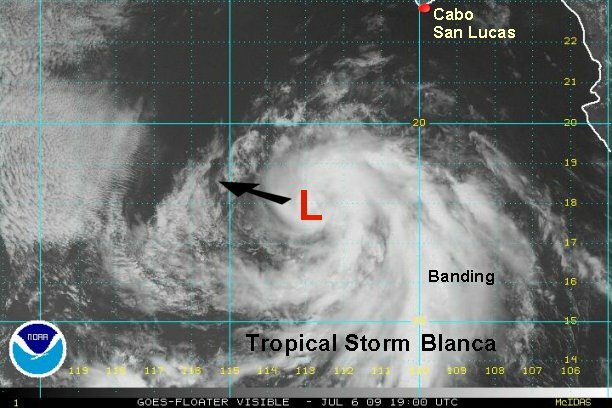 At 2:30 pm edt ( 11:30 pm pdt ) Blanca was centered near 19.6° N / 116.5° W or about 475 miles southwest of Cabo San Lucas. It is now moving northwest at about 11 mph. 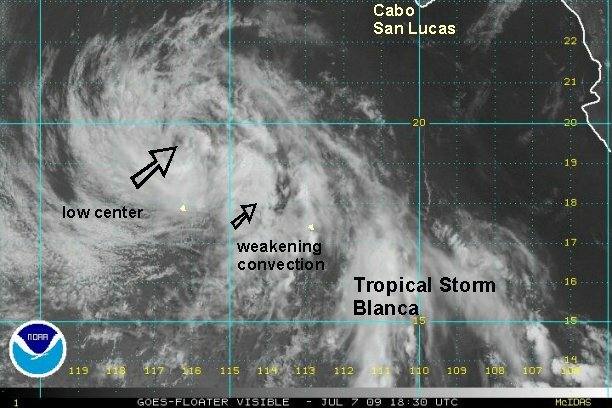 Blanca is moving over cooler water and rapidly losing strength. At last advisory, NHC had estimated 45 mph. We now think that top sustianed surface winds are about 35 mph and no longer a tropical storm. The center of circulation is now plainly visible as shearing has pushed the convection away. The convection that remains is weakening as evidenced by the cold top warming. This will be our last update on Blanca.